The title of this book may lead readers to expect a collection of short stories based around the life and work of Adi Shankaracharya, the great saint and mystic of yore. However, two of the three novellas in this collection are unconnected with the Shankaracharya. One story is set in medieval Europe. It is told by the grief stricken mother mourning her little son, whose heart is buried in a cathedral. 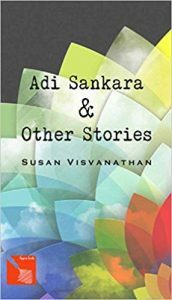 The last story is different from the other two since it is about the experiences of a young Muslim woman in contemporary India, and the social and cultural restrictions she has to deal with in her quest for a mental space of her own. The author offers an imaginative interpretation of aspects of three distinctive faiths. The subject matter and the style of all three stories mark this out as a well-crafted and researched book full of complexities and creative interpretations. the texts attributed to him, his footwear revered in a shrine here, the deities and codification of rituals established by him elsewhere, stand testimony. Visvanathan presents an imaginative rendering of what may have been. The second story, ‘Beyond the Ferry’, contests ‘the idea that fundamentalist is the only perspective from which religion is to be understood.’ The author uses the story of a young Muslim woman who is married when young to an elderly trader and packed off to lead a ‘comfortable’ married life, to explore the marginalization of certain communities in India. Marriage arranged! She must be fourteen. Shazia has a husband waiting. They arrange them before they go to the gulf. Well, I heard that Kamala Das felt free in one. Again later on, Sayir discusses with his mother about his chosen bride. The mother is happy to have a daughter at last because she will make rotis, and press her feet and heat water for her bath. When Sayir says a servant can do these things, his mother says a daughter-in-law can do it much better. A clear commentary on the fate awaiting many a young woman in Indian society. The third story, ‘Palace Complex’, retells a legend of medieval Europe about a young Christian boy whose heart was buried in Lund Cathedral by his grieving mother. The mother’s grief, the tragic loss of a child, leads to deeper questions about the nature of time and space, and how to make sense of our world through the language of dream and myth. All three stories are interesting reads. ‘Beyond the Ferry’, however, deals with a more mundane and often discussed contemporary situation. It suffers in comparison with the other two tales in terms of originality and imaginative interpretation. Monideepa Sahu is the author of Going Home in the Rain and Other Stories (Kitaab, Singapore), Riddle of the Seventh Stone (Zubaan, India), and Rabindranath Tagore: the Renaissance Man (Puffin, India) and the editor of Kitaab’s The Best Asian Short Stories (2017).